Sorry about the long winded story but I have to tell it. This is one amazing race car. It is currently Cams log booked for Marque Sports car racing. It was originally built by Gary Walker Jaguar in Sydney & was one of three that he built with the Turbos. The most famous of the 3 was the Black one he built for Kerry Packer, so he could blow his mate John Laws off in his Porche - so the story goes. This XJS was originally modified back in the 1980's for road use & was fully road registered. Gary apparently used to have a "party trick" where he used to sticky tape a $50.00 note to the glovebox lid & if the passenger was was able to retrieve it under full acceleration, the $50.00 was his & as you guessed, he never gave one away. When originally modified it was fitted with Rayjay turbos & being from aircraft use, they were only oil cooled & not water cooled. They were also mid-mounted on the engine bay & this was not ideal for cooling. Over the years the vehicle ended up in Melbourne where it then underwent major modifications for race track use. Back in the late 90's it was fitted with a 6.7 liter V12 engine with Cosworth sump, race rods & forged pistons. A Motec computer management system was also used (leading technology for the day) It was also fitted with the Jerico 4 speed race dog straight cut gearbox. The brakes were all modifed to Harrop callipers both front & back. It was fitted with V8 Supercar style rotors & used the V8 Supercar 17" x 11" Speedline superlight wheels (the wheels are Peter Brock & Larry Perkins old V8 wheels) There were many further modification over the years that it was owned in Melbourne. I bought the vehicle several years ago & has been always been the most fun that you can have with... (you know the saying goes) It has always created a huge interest amongst both Jag fans & young ones who have never heard of a V12. When the realized that it was twin turbo. they would always ask - V8? & I would have a lot of enjoyment explaining that it was a V12. When I first ran the car, not only would it kick you side ways in a straight line when the turbo's would come on, but it would always boil after a couple of laps. Once I decided to keep the Turbos, mainly because it was so different, the challenge was to get it to be able to run a full race & finish. The first place that we started was with the Turbo's buy replacing them with the Garrett's more forward mounted. You can see the Dyno charts where the red line was running the Rayjay's & the blue line was after the new Garrett's were fitted. The main different apart from just increasing the HP to almost 610HP, was to certainly help the overall driving capability of the car, as it was more like driving on a race cam & not like a sling shot. We then fitted a Davies Craig electric water pump & a better flowing radiator setup. The intercoolers were then downsized as they were totally blocking the radiator. Many other modifications over the next couple of years meant that we were getting closer to our goal of reliability & proving that a V12 Twin turbo would be a brilliant race car. We were very lucky to be able to race Bathurst in Easter 2008 & boy what an experience. Racing both down Conrod Straight & up Mount Straight was like nothing I had ever experienced before. It was such an amazing sensation to be able to gather up 1/2 a dozen cars in each direction on the straights, that I am sure that it must have been very frustrating to the others - especially if they had better handling on the corners. My only problem each race was that because of the length of the circuit, close to 6kms, it would overheat before the end of the race & blow its water out. This was very frustrating & I was even more determined to sort out the issues. Unfortunately I was not able to race Bathurst at Easter 2009 in the XJS as it had blown rear main seal, but was lucky to race a Mk2 which was fun, but not as much. This meant that I had to sort out the XJS sooner than later. The following is a testament to Jaguar's V12 engine because even after all the abuse of overheating, it was the rear main oil seal that finally let go, meaning that we had to remove the engine. Even though it was running the big 6.0ltr crank & all the fancy bits, I had done a lot of research where the 5.3 was a better spinning engine for the turbo's with a squarer stroke allowing it to rev better. I thought the best & cheapest way to test this theory was to try it before spending a fortune on rebuilding the big engine. 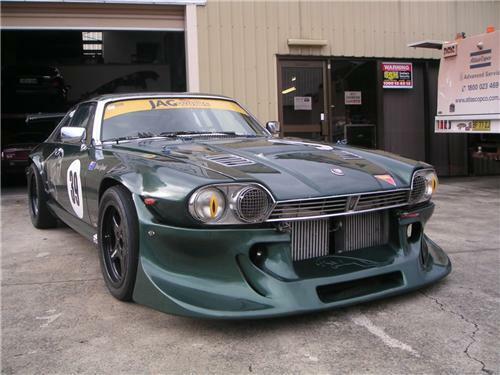 I grabbed a 30 year old V12 out of an XJS that had been parked for 10 years & put it in the race car. I did nothing else except bolt all the turbos on & went racing at Oran Park (gone are the good ol' race tracks) Well, it answered my question of the 5.3 vs the 6.7, because it felt great under full racing conditions & performed really well. Now, I will admit that it only lasted the day before we blew the oil rings out of the poor ol' engine, but it proved to me that this was certainly worth pursuing. I was about to start the build process when I was fortunate to run into at Winton (not literally) Paul Zazren of the Caulfied Jaguar in Melbourne. As Paul has now sold Caulfield & is racing his White Bob Jane replica (very, very fast vehicle) he had a V12 left over from his Caulfield days that he had built for a customer in Papua & New Guinea. This customer had specified that he wanted a V12 twin turbo engine for his hydroplane as was constantly plowing up the big block Chev engines. He was apparently chasing drug runners up there & needed a strong, fast & reliable engine to be able to out run & catch these people. Paul built the V12 engine using only the best parts available & over $35,000 was spent on it with special rods, pistons, crank, heads, cams & turbos. The engine had only just been setup on the dyno ready for pickup & Paul never heard from them again. About 10 years went by & it can only be assumed that the were actually the drug runners & not the chasers, as Paul now assumed that they were either locked up for life or 6' under. I was very fortunate to be able to buy this engine as it saved me having to work out the best ways of building an engine & probably costing me a lot more. Once we fitted the engine & was able to get it all running, I realized that it needed a better engine management computer than the old Motec that was fitted to it as it required a hand held control unit to tune it. I then had the latest Motec fitted with the uprgraded coil pack to drive it. Even though the engine is now producing less HP, the torque is almost 550 ft lb & the car is now reliable. Come on Bathurst 2010, I think that I am ready, well I hope I am? As usual the lead up to an event such as this is just overwhelming & I can only describe it as incredible. After all this work & preparation was the car ready for its ultimate test? If you have ever been lucky enough to race Bathurst, there is no feeling like driving over the hill leading to Mt Panorama, whilst towing the race car that you have spent all this time & effort on, wondering whether it will last the first lap. Well, it all worked perfectly & we finished all races for the weekend. It was absolutely amazing & even more exhilarating than the first time, because we were able to finish the race in style. I often race with a guy who has a V12 6.0ltr injected E-Type & once on Conroad Straight it was amazing how my 5.3ltr turbo sailed past his 6.0ltr. People asked me did I win the race & always answer that even though I may not come first all the time, that if I finish & get the checkered flag that in my mind I have won & will always be happy with that. Jerico race gear box - freshly rebuilt - straight cut gears with dog clutches - same as Nascars use. 4 spot Harrop brakes front & back fitted to V8 Supercar rotors. Body has some cracking around the flares on the guards & could do with repainting. Wiring is all working fine but I was going to simplify it & put in a race loom. This is a regretful sale & is only being offerd due to the fact that I have chronic health issues. You may notice that I have listed many other vehicles & projects also for sale. Please don't hesitate to ask any questions. Buyer to contact us within 24 hours and must place a 10% deposit to secure the vehicle. I reserve the right to relist or offer a next chance to the next highest bidder if a deposit is not received or other arrangements are made. Please note that you are bidding to purchase the vehicle & not for the right to view. No warranty is either implied or given in respect to this vehicle. All purchasers are encouraged to make their own inspections. If you need any further details or want to make an appointment to inspect please contact me on (0419)213770.